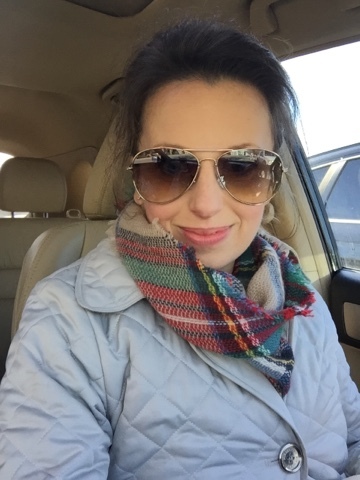 I'm always curious to check out the "day in the life" posts of my favorite bloggers, however mundane and normal they may be. In fact, it's pretty refreshing sometimes to see that everyone is making their own coffee at home, eating leftovers, and even (gasp) fitting in a moment here and there to just be lazy. 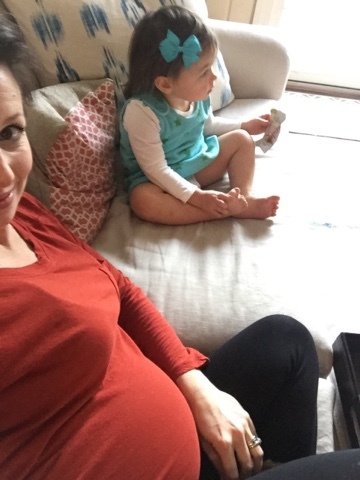 Recently, I've had a few emails from readers wanting to get some ideas about how we spend a typical day now that I am staying at home with Camille. Camille wakes, Ian and I are still so sleepy, ask her over the video monitor to lay her head down, find a toy, and OHMYGOSH it works! We don't go back to sleep but we are able to wake up slowly while she rests for a little bit more in her crib. Camille is back up, I go get her from her crib and bring her to our bed for snuggles. She is acting so sweet this morning, patting Ian's face and mine. She gets a little whiny wanting her "ni-ni" (pacifier) but we explain that it's just for sleeping and she can have it again during naptime. Camille's diaper is changed, our hands are washed, my contacts are in, and Ian's brewing me a cup of decaf in the kitchen. Camille is being so good, so Ian lets her sit on his lap and watch a video about kittens on Youtube. Breakfast. 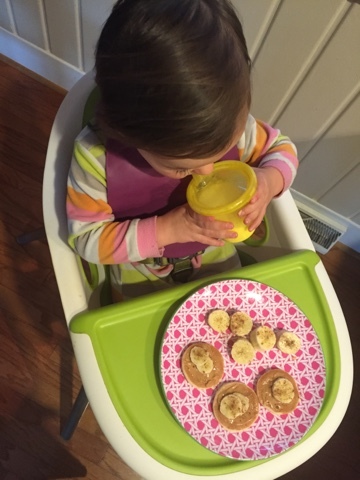 Three mini-pancakes with peanut butter and a banana for Camille, cereal for me. Playtime, non-structured. 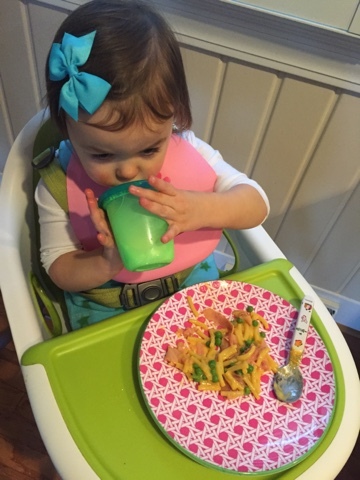 During this time we typically play with her Fisher Price house, feed bottles to babies, or look at books. I strip our bedsheets and start a load of laundry. We also spend this time trying on coats that I just found in the back of her closet. We are getting an earlier start to the day today since we have a 9:30 playdate. Typically, she would nap for an hour at 9:30, but those naps have recently grown shorter so I'm not opposed to skipping over them here and there as long as she's happy and not grouchy. Camille is dressed and ready for the day. I hop in the shower and she plays with a baby and a bottle on the floor. I skip shampooing today and opt for a dry shampoo/updo combo. I get dressed and she steals Ian's toothbrush from the drawer ... standard. Just about to start my makeup routine, gotta hoof it! Leave the house for our 9:30 playdate (whoops). Luckily it's just a few minutes away. Arrive outside of Starbucks at South Park Mall for the playdate. I'm definitely not the last one to arrive -- phew, surrounded by moms who understand. We let the kids run around and play and get to know each other. 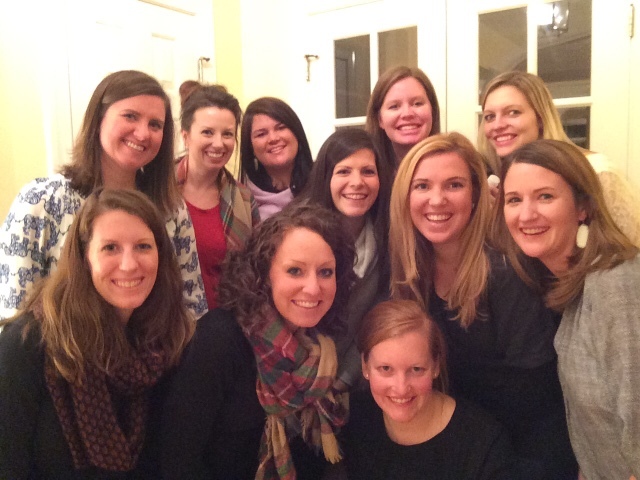 This is the first time that I'm meeting all of these moms -- it's a playdate that was formed from a Facebook selling group I'm a part of here in the South Park area. The kids get along really well and Camille steals everyone's snacks. Trade phone numbers with several moms, and am excited to plan some future playdates! Camille gets back in the stroller and we walk a little around the mall. I have a $15 off coupon at LOFT for my birthday month and I'm down to zero pairs of sunglasses, so we head to that store, bypassing all of the cute clothes I can't fit in currently, and head for the sunglasses. I go with this pair of aviators which are only $12, and my birthday coupon covers them completely. Score. 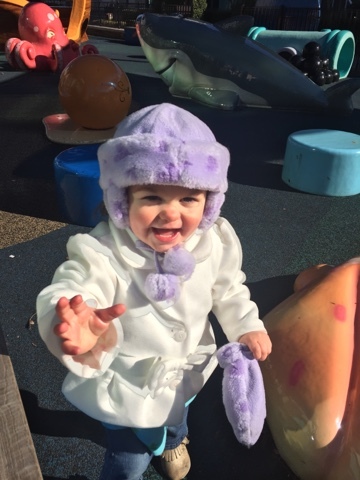 Camille has been great so we bundle up and head outside to the play area where she has a blast until we head to the car at 11:30. Back home. Hands are washed, lunch is being prepped. I'm heating up food while Camille is creating a mess at my feet. We are eating a little earlier than normal due to that skipped nap -- I am going to try to start the afternoon nap a little early in hopes of bypassing any exhaustion-related meltdowns. 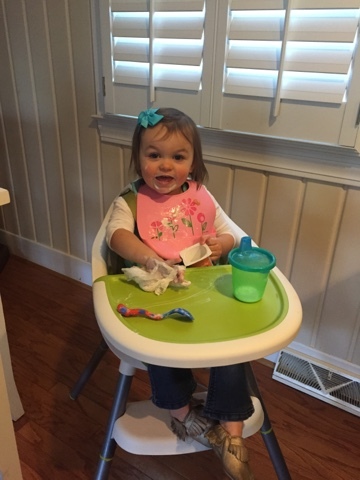 Camille has macaroni with ham and peas, and then won't stop talking about "yo-yos" so she also eats a cup of yogurt. She also has a cup of milk at each meal. 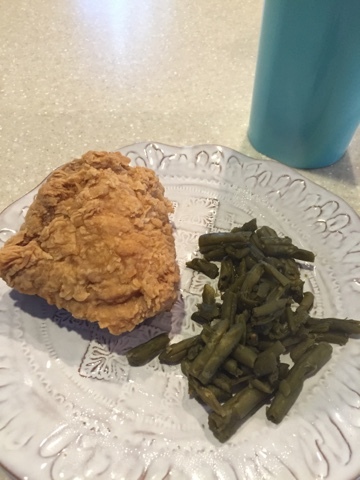 I typically eat leftovers from our previous nights' dinners for lunch, and today I have a piece of fried chicken and some green beans. Today was more hands-on and we played hide and seek around the house and colored in her "coloring box." 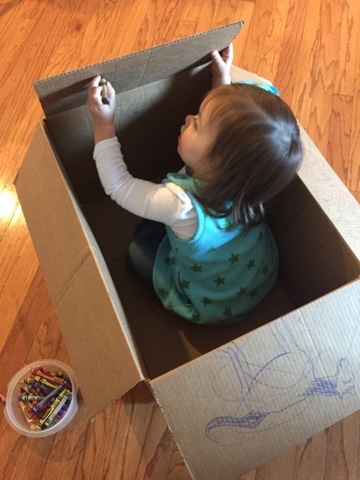 This is just a cardboard box from an Amazon shipment that I let her sit in with three crayons and we draw on the walls of it. Cheap, cheap fun. I also hand wash dishes, load the dishwasher and get it running during this time. Camille walks up to it 10 minutes into the cycle and hits the "reset" button. So I start it all over again. Head back to Camille's room for a fresh diaper and some reading. She chooses for us to read Gluey: A Snail Tale and I inwardly groan because it's a looong book. But the last time we read it with her snuggled up on me in the rocking chair, it put both of us to sleep. Well, we are now 2 for 2 as she's asleep on my chest and drooling on my shirt and I'm drowsy myself. I slip her down into the crib right at 1:30, turn on her white noise, pull the drapes and I'm out. Spend the next little bit doing some blogging work, entering Pampers codes, getting back to friends' Facebook messages and via email. Camille's up! Short nap! Ian is home now and he goes in to get her up. I love spying on them on the video monitor. Ian spends the next 20 minutes in the room with her playing with her, getting her a fresh diaper, and reading three books. Having this extra little time to respond to emails is pretty awesome and it's a treat that he's home so early. This is the time when all of Camille's dreams come true ... she gets a television show and a snack. 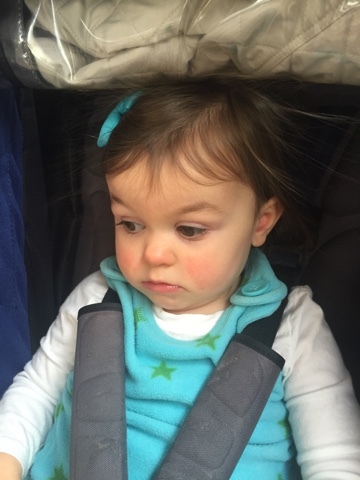 I know, I know, no screen time before age two, but she's typically a little grumpy when she wakes up from her afternoon nap, and I have found that a quick Sesame Street or Sofia episode on DVR or On Demand really helps her bridge that gap. Snack today is a fruit pouch and a cup of water. 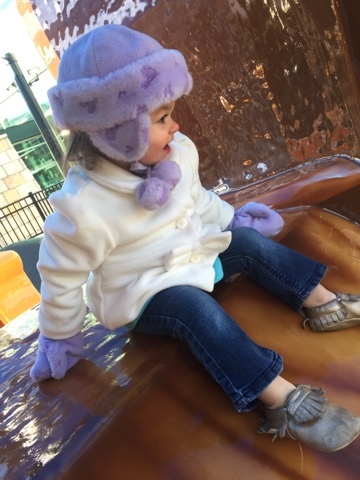 This afternoon playtime is typically when we get out of the house and run any necessary errands or go to the park. Today it's just blustery cold and miserable, and we've already spent some time at the mall, so we spend this playtime indoors at home. 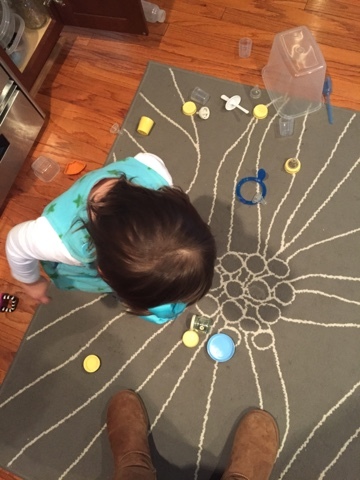 Camille is really into art and Play-Doh these days, so we do a little bit of both. The small Play-Doh cups were a birthday gift to her from a girlfriend of mine, and we only take out one color at a time for her to stretch out the fun. :) For art, I just have a stack of colored construction paper on hand and washable Crayola crayons and I let her go to town. All about CHOICES these days, I let her choose between baby blue, white, and pink paper and she breaks into a big smile as she considers all of them and then goes with the pink paper. She is really into the color purple and the number 9, so we do lots of art based around that, ha! One of her very favorite things to do is to make art for Dada and greet him at the door with it when he comes home. He's home from the gym around 4:30 and she's right there at the door, waiting for him with her art in hand. It melts his heart (and mine) and she just seems so proud to show him. We're playing in Camille's room with her new play kitchen and the felt food my aunt made her. She's starting to get a little fussy and I decide to start her dinner early, around 5:30 instead of 5:45. For dinner, Camille has a quinoa veggie burger patty, some sliced peaches, and some cheese along with a cup of milk. I'm cleaning out the dishwasher while she eats and my back is starting to hurt a little bit. Bathtime. Ian takes the reins on tonight's bath which is HUGE because she typically is pretty adamant that I'm the one there. 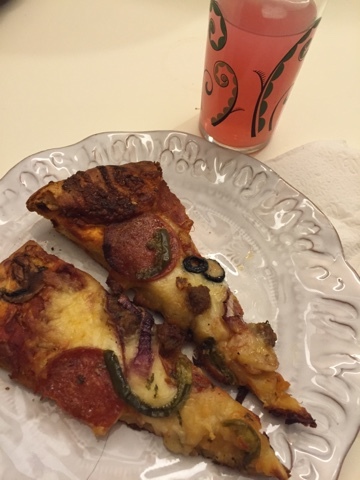 But he knows my back is aching, and this also allows me to heat up some leftover pizza as a quick dinner before I leave the house for Bunco tonight. 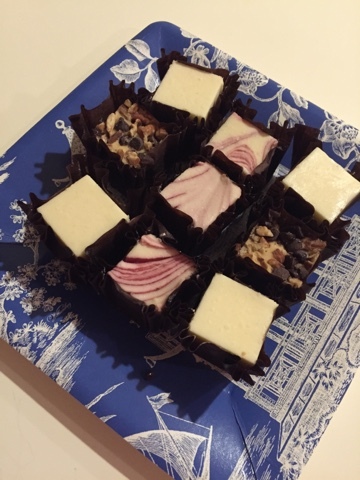 I am so un-fancy and I just thaw some mini-cheesecake squares to bring to Beth's house on a paper plate as my appetizer contribution. Camille is out of the tub and Ian's already helped her brush her teeth. This is seriously making my night because typically I'm the one who does bath, teeth, pajamas, books, everything. I'm so happy. We let her run around naked for a little bit due to a little diaper rash she's got, and Ian ends up cleaning up some tee-tee under her coloring table (whoops!) while I get her cleaned up and in jammies. We read Sofia The First in the rocking chair together and then she goes to sleep right at 7:00 like a champ. 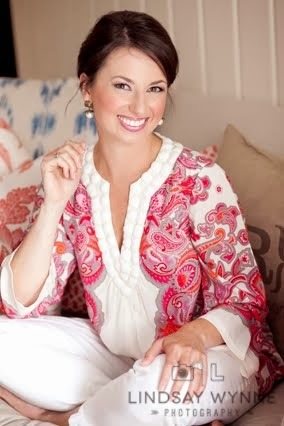 A quick blush refresh and smooch to Ian, and I'm out the door for Bunco! I've got my Adele CD in hand and am so excited to listen to it in the car, only to get outside and realize that the CD is in my laptop and all I have is an empty case. Then I realize that my car desperately needs gas. Two big boos, but I'm still excited to see my friends! I fuel up in the 40-degree temps and am at Bunco by 7:40. 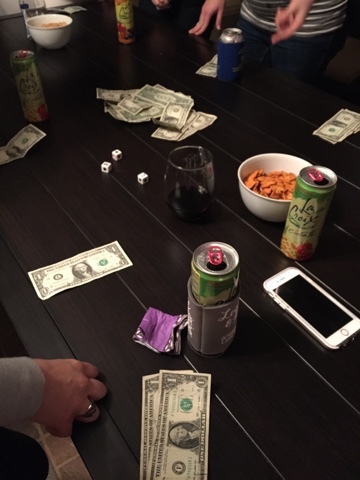 We play Left, Right, Center and one round of Bunco. Great times as always with these ladies! 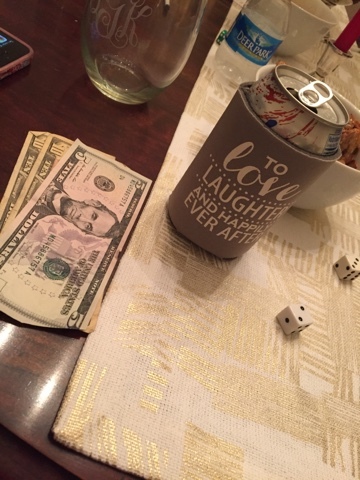 I even won $25 for the night due to having the last Bunco and the most losses (5 losses, 1 win!). I leave to head home around 10:15. This is really late for me! So, there's yesterday, and today will be quite similar. We are helping a friend out today by picking her son up at school since her flight home gets in later than his dismissal time, so that will be a fun little adventure. I'm also running more laundry and will start tidying up the house today in preparation of hosting some friends over here for dinner tomorrow night. Today is also a big hairbow-making day for me since I will have some for sale tonight on my Instagram account (@alizadventures). So funny! This morning I decided it was time for me to do another day in the life post since it's been a while. It's only 11:00am and I'm already not doing well with the pictures! Oh well! It's funny how quickly our days change and one day we'll look back on these days with such fondness! My favorite kind of post!! She is such a cutie! Aww what a great post! And don't you give a second thought to having Camille watch a little TV--because of watching Sesame Street as a baby, I knew my alphabet before I could talk! Loved reading about your day! 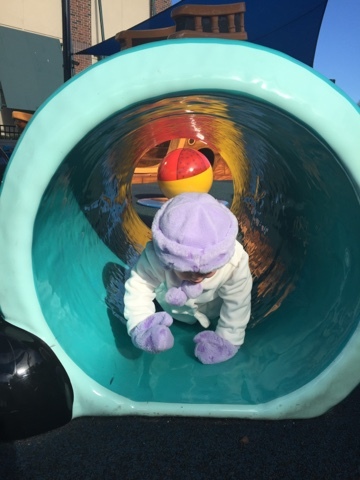 You should check out Go Noodle for cold weather days. Kids love it. Happy New Year! 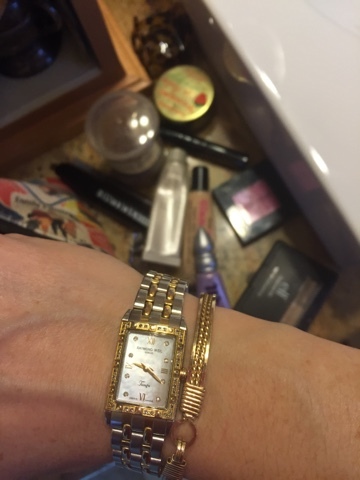 I always love these day in the life posts. It's so interesting to see what everyone does all day. And I love your honesty about the Facebooking, TV time for Camille, etc. It shows that you are real! I love these types of posts!! And your cheesecake squares were super yummy, even if you think they are unfancy! Ps, love C's hat and mittens!! Where did you get those?! I did a post like this today too! The days are long, but the years are short. Thank goodness! I love these! 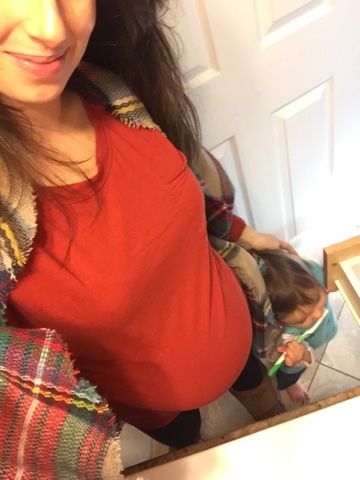 Its so nice to see what other moms do during the day, since my husband tends to think I do nothing all day haha. Its busy with a little one! I love Camilles hat! So cute! These are the best kind of posts! So, Emmy used to hit the reset button on the dishwasher (daily) & we finally involved her in the process & she hasn't done it since. She gets to close the door where the soap goes, close the dishwasher door, and then hit the "start" button. Maybe that would help Camille from hitting reset too? We also started using the DustBuster.... Soon, I'll be eating Bon bons on the couch! These kinds of posts are always my favorite. Thanks for giving us a glance at your day. 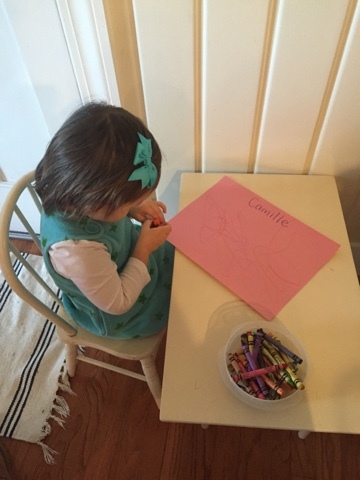 I think it's so sweet how Camille loves showing her coloring to her daddy when he gets home. That is so precious! 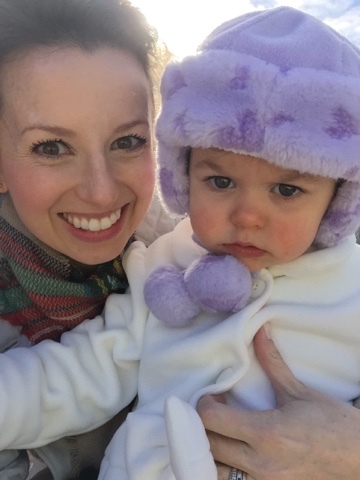 what fun day-you're a busy mama! and cheers to keeping it real! love this.